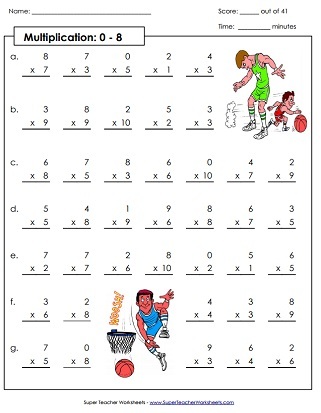 On this page, you'll find a series of worksheets for helping kids learn their basic facts up to 8x10. We also have some activities that focus specifically on the 8s. First, students skip count by 8s. Then they complete an input/output box. After that, they compare numbers using the symbols <, >, and =. Then they write a multiplication fact to go along with the illustration. 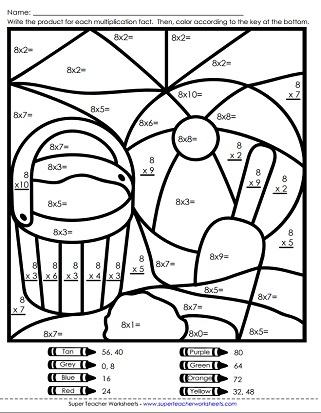 This math mystery picture has a summery beach scene. Students solve the math problems and write the answers on the page. Then color each space according to the key to see the mystery picture. Place these puzzle pieces on a table or floor. 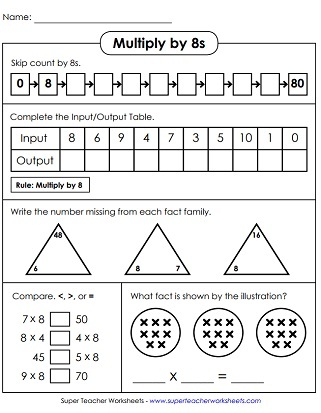 Have small groups match up the multiplication facts with the correct answers. Students will multiply by 8s in order to fill out all the bubbles in the multiplication caterpillar in this printable math activity. Students can create an origami toy that can be used to practice basic multiplication facts with factors of eight. Can you students answer these word problems and critical thinking questions? In order to do so, they'll need to know how to skip count by 8s up to 80. Count by 8s and fill in the missing numbers in the number lines on this skip-counting worksheet. Skip count from 0 to 224 by 8s. This page has robot-themed graphics. Write the numbers on the penguin bellies as you skip count. Numbers as high as 192. This worksheet is very similar to the sheet above, except that you'll write the numbers on the balloons instead of penguins. Students answer 41 basic fact questions with factors of 0, 1, 2, 3, 4, 5, 6, 7, and 8. Facts through 10s, up to 8x10. Practice multiplying by 0s, 1s, 2s, 3s, 4s, 5s, 6s, 7s, and 8s. This drill sheet has 39 problems. This version includes 11s and 12s, up to 8x12. Assess your students' knowledge of basic facts for the 0s, 1s, 2s, 3s, 4s, 5s, 6s, 7s, and 8s times tables. Facts through 12, up to 8x12. Practice multiplying by the number 3. Includes mystery pictures, skip counting lessons, and more.